subgenus Pinus, section Trifoliae (Duhamel), subsection Australes (Loudon). Pinus taeda, as described in 1753 by Carolus Linnæus (1707–1778), in Species Plantarum vol. 2, is commonly known as Loblolly pine, or North Carolina pine, oldfield pine, bull pine, and rosemary pine. The species name of this very resinous conifer was borrowing from Linnæus from the ancient Roman name for torches and the pitchy pines from which they were made. Ethnobotany. In the southeastern United States, P. taeda is commonly used in plantation forestry, along with P. elliottii and P. echinata. Commercially, it is a valuable pulpwood and timber species. It is also an important timber species outside its native range, with substantial plantations in South Africa, Zimbabwe, southern Brazil, Argentina, China and Australia. illustration contributed by: Missouri Botanical Garden, St. Louis, U.S.A. Description. Loblolly pine is an evergreen coniferous species of tree that grows to mature heights of 100 to – 125 feet (30 – 35 m) with a trunk up to 1.3 to 5 feet (0.4 – 1.5 m) in diameter measured at breast height. Exceptional specimens may reach 160 feet (50 m) tall, the largest of the southern pines. Trees mature with a broadly conic to rounded crown. Bark is red-brown in color, forming square or irregularly rectangular, scaly plates, with no present resin pockets. Branches grow spreading and ascending. Twigs are moderately slender at circa 0.4 inch (1 cm) thick, orangish to yellow-brown in color, aging darker brown with a rough texture. Leaves (needles) are borne in fascicles of three, growing sometimes twisted, measuring 4.8 to 8.8 inches (12 – 22 cm) long — an intermediate length for southern pines, shorter than those of the Longleaf pine (P. palustris) or slash pine (P. elliotii), but longer than those of the Shortleaf pine (P. echinata) and Spruce pine (P. glabra). The needles usually persisitt up to two years before falling, which gives the species its lush, evergreen character. Although some needles fall throughout the year due to severe weather, insect damage, and drought, most needles fall during the autumn and winter of their second year. 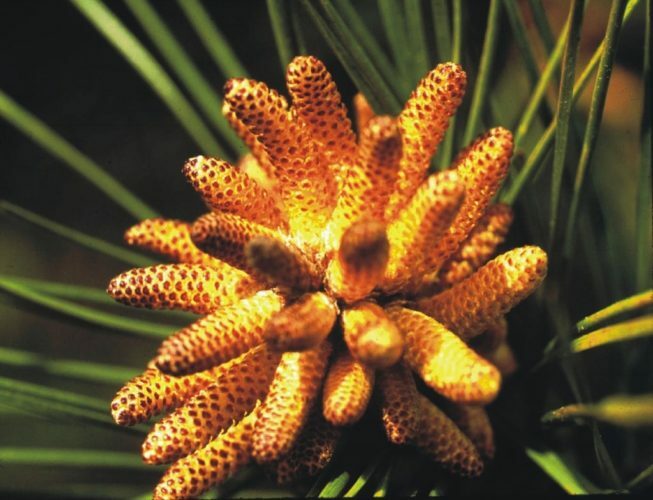 Pollen cones are cylindric, measuring 0.8 to 1.6 inches (20 - 40 mm) long, yellow to yellow-brown in color. 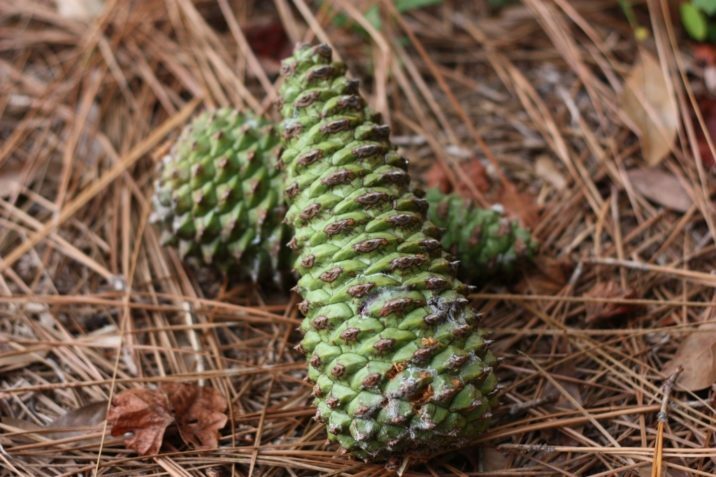 Seed cones are green in color, ripening pale buff-brown, measuring 2.8 to 5.2 inches (7 – 13 cm) in long, by 0.8 to 1.2 inches (2 – 3 cm) broad when closed, opening to 1.6 to 2.4 inches (4 – 6 cm) wide. Seed scales bear a sharp 0.12 to 0.24 inch (3 – 6 m) long prickle. Distribution. This species is one of several pines native to the southeastern United States, from central Texas east to Florida, and north to Delaware and southern New Jersey. U.S. Forest Service surveys found that loblolly pine is the second most common species of tree in the United States, after red maple. 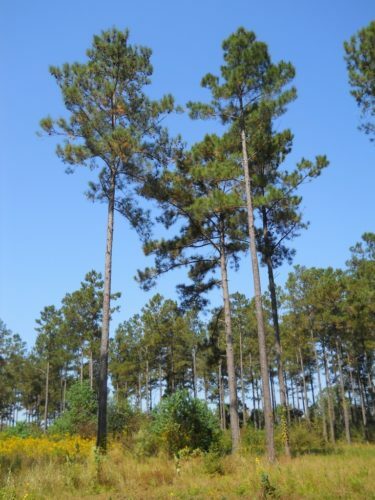 The word loblolly means "low, wet place", but these trees are not limited to that specific habitat. 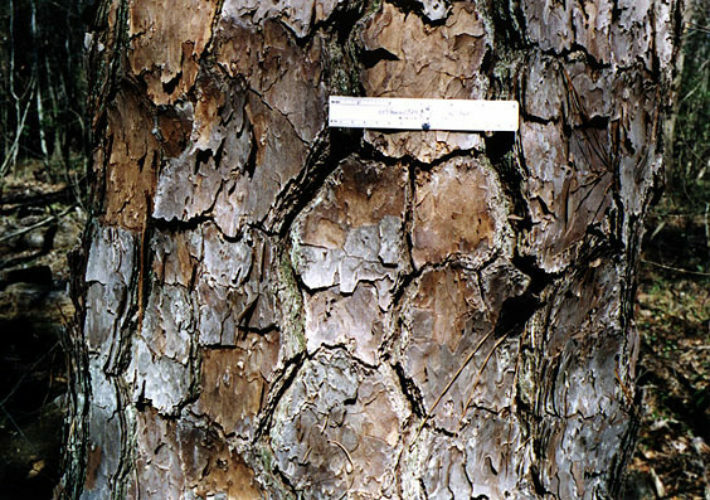 Loblolly pines grow well in acidic clay soil, which is common throughout the South, and are thus often found in large stands in rural places. 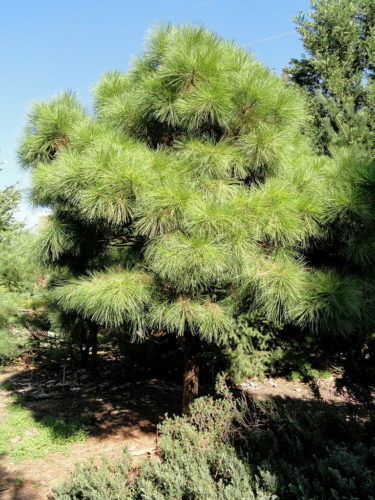 Other old names, now rarely used, include oldfield pine, due to its status as an early colonizer of abandoned fields. 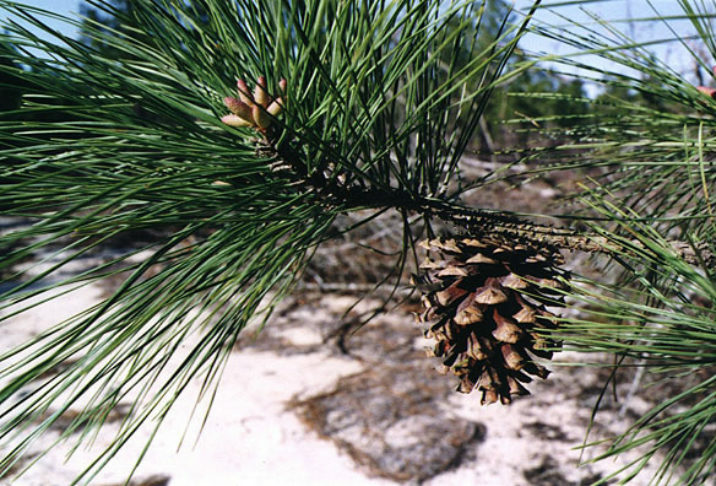 With the advent of wildfire suppression, loblolly pine has come to prevalence in some parts of the Deep South that were once dominated by longleaf pine and, especially in northern Florida, slash pine. Hardy to USDA Zone 7 — cold hardiness limit between 0° and 10°F (-17.7° and -12.2°C). The tallest loblolly pine currently known, in Congaree National Park, is 51.4 m (169 ft) tall, and the largest, also in Congaree National Park, is 42 cubic meters in volume. The famous "Eisenhower Tree" on the 17th hole of Augusta National Golf Club was a loblolly pine. U.S. President Dwight D. Eisenhower, an Augusta National member, hit the tree so many times that, at a 1956 club meeting, he proposed that it be cut down. Not wanting to offend the President, the club's chairman, Clifford Roberts, immediately adjourned the meeting rather than reject the request outright. In February 2014, an ice storm severely damaged the Eisenhower Tree and shortly thereafter it was removed. 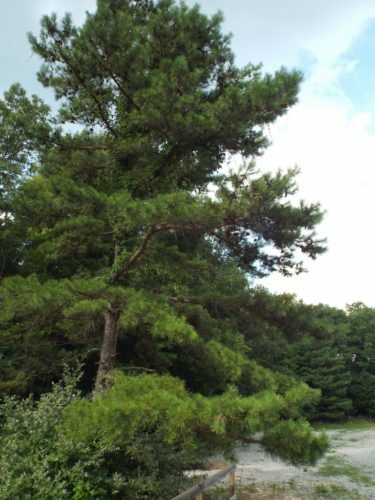 Pinus taeda growing in Altamount, Tennessee. Pinus taeda (Loblolly Pine) pollen cone detail. Pinus taeda 'Little Albert' — a specimen at the J. C. Raulston Arboretum at North Carolina State University, Raleigh, North Carolina. Pinus taeda immature seed cones. 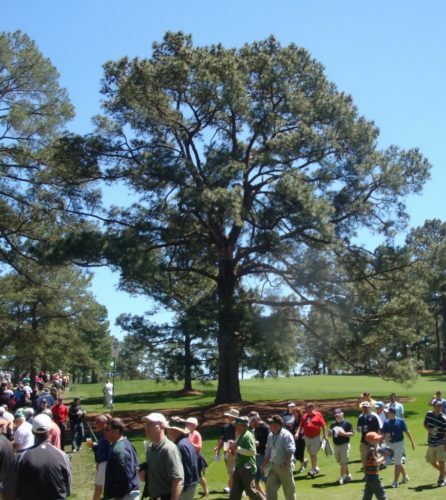 The famous "Eisenhower Tree," a Pinus taeda at Augusta National Golf Club during the 2011 Masters golf tournament. Pinus taeda — bark detail. 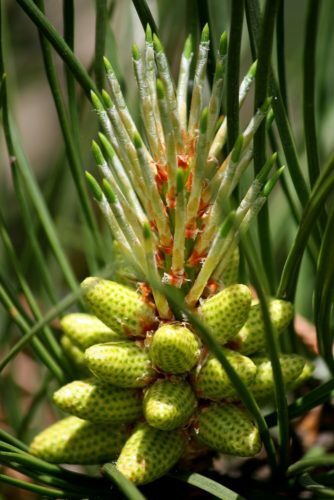 Pinus taeda — foliage and mature seed cone detail.